Search 'Alkitab' or 'Quick Bible' in your device's Play Store app, and choose the Yuku version. 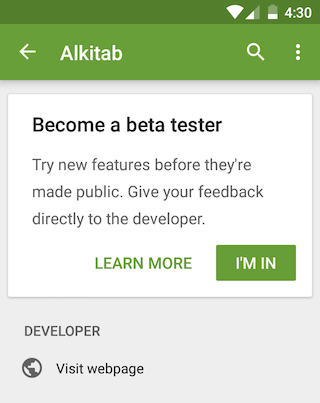 Scroll down to the bottom and you should see "Become a beta tester" section. Click "I'm in" and after a few minutes you should be able to update the app to the Beta version. Please join the bibleforandroid Google Group for discussions! TODO fix issue: the start day of reading plan is reset when app reinstall, even after sync. Notifications have categories so you can modify them by yourself. There are currently four kinds of notifications: announcements, devotion downloader, translation downloader, and devotion reminder. Copying or sharing a secondary-version verse will prepend the book name from that version instead of the primary version. Removed city, church, and religion fields from sync user registration. Removed "show hidden versions" from options. Grouping of languages on list of translations. Added Italian (it) and Turkish (tr) UI languages. Thanks to the translators. Source code is updated for use with Android Studio 3.1.3. Uses internal download manager instead of the system one. The internal download manager is transient - does not support resuming and will stop if you terminate the app. This should fix the problem when system's download manager is not available like on Kindle Fire devices. Fix detecting verse reference not detecting "da" but "Da"
Fixed detecting verse reference in notes that is followed by the word "the"
No longer ask for importing old markers from different app package. Use "Import old markers" instead. Move sync triggering each time the Bible screen is opened to when the app process is started up. Change search hint from "lord god" to "city of david"
Material Design. Holo design is now switched to Material Design, following style of Android Lollipop. Sync: remotely synchronize bookmarks, notes, highlights, and labels and across devices. On GRID navigation mode, chapters and verses are now shown in multiples of 5 or 10. Full screen mode now works better, and clicking on verses does not cause the whole screen to shift down.